December 21 -- On January 27th, the Sea Cliff Village Board will be hosting a Town Hall Meeting to discuss proposed revisions to the Village tree ordinance. The meeting is not a public hearing on draft legislation, but rather an opportunity for the community to offer its opinions on what is currently under consideration before such legislation is written. The proposed regulations, if adopted, would significantly loosen restrictions on tree removal in the Village. The current law requires that a resident wishing to take down a tree that is greater than eight inches diameter at a height of 4.5 feet, first obtain a permit before removing it. Under the ordinance, the Tree Committee, made up of the Buildings Superintendent, a Village Board Trustee, and two residents, has the authority to grant or deny tree removal permits. 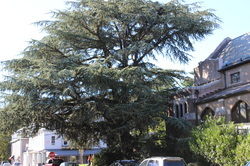 The new proposal would allow residents to remove from their property, without restriction, trees with less than a 10 inch caliper (diameter); for trees with a 10-20 inch caliper, a resident could remove up to three without a permit, but would be required to provide notification to the Village; and, if a resident wished to remove more than three trees of that size, or any tree with a caliper greater than 20 inches, a permit issued by the tree committee would be required. Under the new proposal, the Tree Committee would be made up of three resident members, one of whom would serve as the chair. In addition, two residents would be designated alternate members. The Superintendent for Buildings and Grounds and a Village Board Trustee would act as liaisons to the the Committee, but neither would be voting members. The changes under consideration came about as a result of input from the current Tree Committee and from the community at a September 16th Town Hall Meeting during which nearly 50 Sea Cliff residents gathered to discuss the current village tree ordinance and many offered their thoughts on whether that policy ought to be revised or eliminated altogether. At that meeting, Mayor Bruce Kennedy and Trustee Carol Vogt explained why the Board was considering changes to the policy. “Sandy changed everything," the Mayor said, as it has caused residents to re-examine trees on or near their property, worrying that the next windstorm could bring a limb or entire tree down on their house. Ms. Vogt added that with increased concerns about trees, a significant burden has been placed on the tree committee which has received approximately 100 tree removal applications per year, and has had to spend three or four hours every other week to inspect sites. Only about 2% of those requests have been denied. "The way we are going is not tenable with what the committee has to do,” She explained. In an interview with Northwordnews this past summer, Ms. Vogt explained that the Village wants to strike the right balance between property rights and maintaining the treed character of the Village. The question that needs to be considered she said is “What role should government play in determining whether or not a resident can take down a tree?" The January 27th Town Hall Meeting will be held at 8 pm in the upstairs meeting room at Village Hall.